The Perimeter Control Robot is designed for security fence patrolling and is equipped with six high-sensitivity cameras. 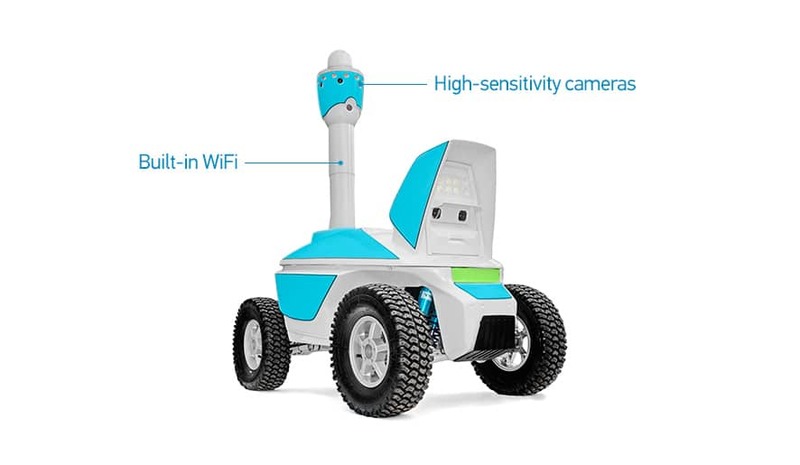 This robot’s characteristics allow effective outdoor surveillance, even on poorly lit segments of the patrolling route and when operating in areas of high contrast between light and shade. This robot provides high-quality 360-degree panoramic surveillance, both on the move and during stops. Surveillance around the robot’s location ensures reliable control of the secured area and recording of surrounding activities. The wheel suspension efficiently damps down vibrations occurring while moving on uneven surface, thus capturing video images of quality-high, even for remote site surveillance. 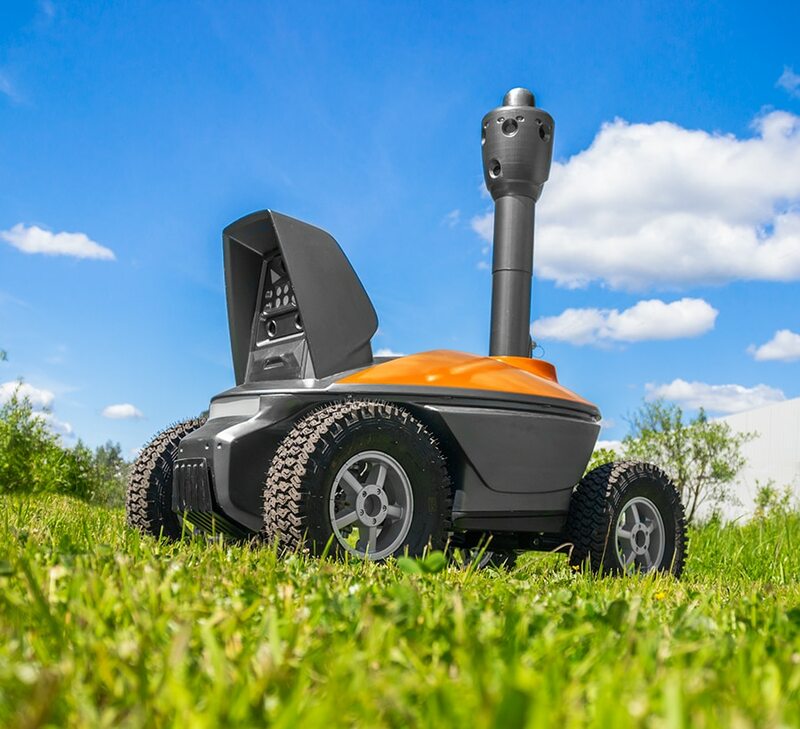 The autonomous S Series UGV is equipped with a CCTV system. 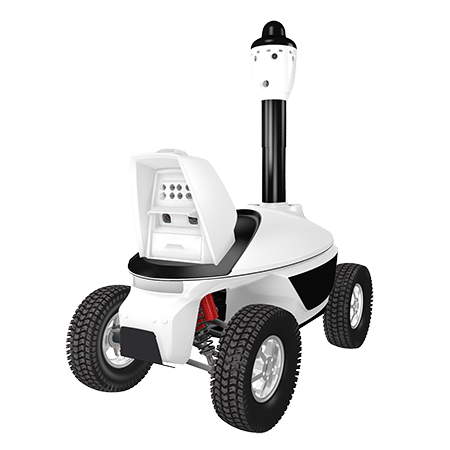 With the mobile 360-degree surveillance system installed on an unmanned vehicle, continuous and around-the-clock patrolling of secured-fence perimeters is ensured. A transparent wire fence creates no obstacles for the surveillance over the adjacent outside areas while the robot is moving along the patrolling route within the secured area. The patrolling route can be changed automatically, depending, for example, on the time of day, or manually, depending on emerging operational risks. This robot is also useful for short-term strengthening of site security when deploying stationary CCTV cameras is considered uneconomical. The S5 Perimeter Control Robot is capable of patrolling a facility’s perimeter without human supervision. The operator only needs to supervise the feed from the CCTV cameras. The unmanned vehicle, used as the robot transport base, successfully moves along surfaced paths designed for pedestrians. The robot cannot be used on public roads or in the presence of people not trained in robot-patrolled site safety. The Perimeter Control Robot provides remote CCTV surveillance through WiFi data transfer. The feed from the 360-degree cameras is transferred via the in-built WiFi equipment. Under ideal conditions and provided a direct line-of-sight, the robot might move over a half-mile away from its base station. In standard conditions, WiFi routers must be placed along the secured perimeter to ensure stable radio coverage throughout the entire patrolling route. The in-built digital video recorder maintains continuous CCTV surveillance in cases where wireless feed transmission is not possible. The recorder continuously records the video feed from all the cameras and provides remote access to the video archive via WiFi. In case of a communication channel failure, the operator can playback the missed fragment from the recording. Wireless communication channel instability does not affect the movement of the mobile robot; having reached a weak WiFi signal area, it will eventually leave the area and restore data transfer and remote access to the video archive. The archive can be copied to an external hard drive or NAS; this may take a few hours, so it is advisable to perform this operation when the robot stops for battery recharging. A secured perimeter fence equipped with sensors allows an authorized user to automatically control robot patrolling. When a sensor of the intruder detection system is activated, the mobile robot receives a signal and heads for the intrusion area. While in movement, the 360-degree camera video feed is transferred to the Central Monitoring System (CMS) of the site’s security service. A security officer patrolling on foot can, at the same time, view the feed from the robot’s cameras on a mobile computer. The described operation mode is specifically notable for the fact that the Central Monitoring System can be located outside the secured area and supervise several secured sites at the same time. All the data and video feed from the CCTV cameras will be transferred via public internet channels in an encrypted mode. In case of an alarm, the CMS operator will first send the robot to assess the situation, and only when the sensor triggering is confirmed to be non-false, will he then call in backup mobile patrol officers. Robot patrolling guidance is based on three different technologies. In the daytime, the robot navigates using visible landmarks in front of it. This method is effective for territories rich in buildings and other artificial constructions. However, it is poorly suitable for open spaces with no clearly shaped facilities. In this case, it is optimal to plot the cruise routes along the patrolling walkways. The color difference between the walkways and the remaining territory provides information for the robot to accurately adjust its location. Combined with the satellite navigation system, this method ensures highly accurate passages. For nighttime perimeter patrolling, it is necessary to have the cruise route lit up by street lights. Standard 6 lx illumination for urban walkways will be sufficient for stable patrolling. If it is impossible to reach the necessary illumination level on certain segments of the cruise route, night markers should be installed and can be placed on security fence posts. The Perimeter Control Robot is equipped with a headlamp to illuminate road surfaces and obstacles. Close-range area illumination is necessary for correct operation of stereoscopic cameras, which are used to detect and avoid obstacles. The low beam headlamp switches on automatically at dusk. Continuous perimeter patrolling drains the robot’s built-in accumulator batteries. Placing several auto charging docking stations directly along the patrolling route is advisable to enable automatic battery recharging. 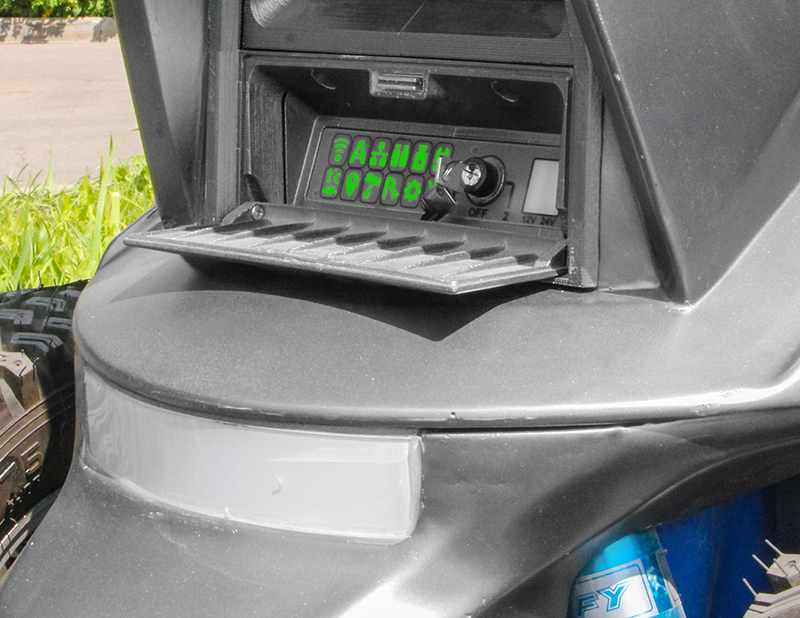 In this setup, the robot will remain in operation and will continue to carry out CCTV surveillance in stationary mode while its batteries are recharging. While in operation, the state of the robot’s systems is shown by the light indicator, the colors of which are discernible at a distance of more than 10 feet. The color of the indicator informs about the remaining battery charge, temperature of the robot’s inner modules, WiFi availability, and faults of the robot’s systems. The robot is switched on and off by using a removable mechanical key. The diagnostics panel installed on the robot helps for detecting superficial failures.